Weld-On 2767 is a green, medium bodied, fast set, very high strength solvent cement for cementing all schedules and classes of PVC pressure and non-pressure pipe and fittings through 150mm. 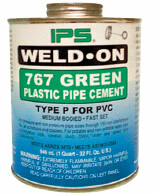 Weld-On 2767 is for use on all types of PVC plastic pipe applications, Type I and Type II. It is suitable for use on potable and non-potable water pipe, turf irrigation pipe, conduit, duct, sewer and drain, waste and vent systems. Detailed directions on making solvent cemented joints are printed on the container label. An installation video covering solvent cementing is available. It not only describes the basic principles of solvent cementing, but also covers the handling, storage and use of our products. It is highly recommended that the installer review the instructios supplied by the pipe and fitting manufacturer. 3 years expectancy in tightly sealed containers. The date of manufacture is stamped on the bottom of the container. Stability of the product is limited by the permanence of the container and the evaporation of the solvent when container is open. Evaporation of solvent will cause the cement to thicken and reduce its effectiveness. Adding thinners to change the viscosity is not recommended. Weld-On 2767 meets ASTM D 2564 and the requirements of the Australian/New Zealand standard (AS?NZS) 3879 for Type P solvent cement.